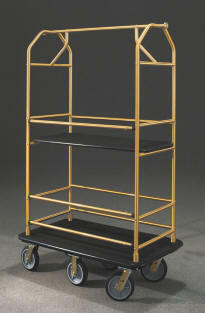 “Glaro Glider” Value Bellman Carts deliver high performance at a low cost. The distinguishing feature of the Value Cart line is the design, which includes solid machined aluminum disc hooks at the top for additional hanging capacity. Value carts feature the same attributes and technology as other Glaro luggage cart models, and are available in four and six wheel models. They feature 1” diameter heavy wall solid aluminum tubing used for the upper frame. All models are standard with solid rubber casters. Glaro offers the four wheel version in 35”, 40”, and 48” lengths. 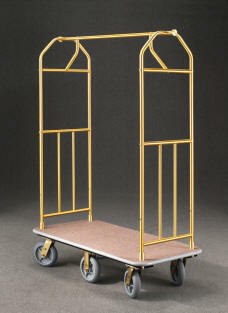 These models parallel the six wheel models by conveniently moving luggage, supplies, and equipment. Glaro four wheel bellman carts have a wider turning radius than the six wheel carts and have almost as much load capacity. Two swivel and two fixed position casters are standard. 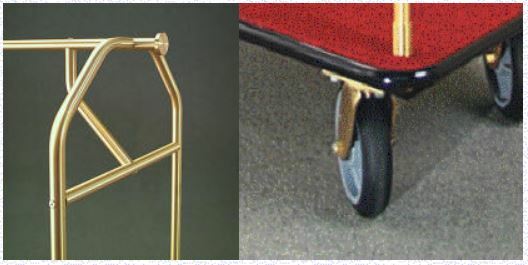 The unique engineering and design provides what other carts do not have; the ability to pivot in place on a central axis. Glaro has coined the term “pinpoint maneuverability” to describe this feature. As a result an operator can maintain complete, precise, and safe control with minimum effort. These 40” and 48” length carts are designed to be pushed or pulled when standing at either end. Engineered and designed for efficiency, the six wheel value carts have a hi-tech swivel caster mounted in each corner and two rigid casters in the center of the chassis to provide a pivot point. Eight inch diameter non-marking, solid rubber or pneumatic, shock-absorbing, ball bearing casters guarantee a quiet smooth ride. This design insures a high level of accuracy which is especially useful when maneuvering in and around elevators, turning corners, and moving through doorways or other tight spaces, while reducing building damage and potential personal injuries. By adding a removable shelf and containment rails to the standard Value Bellman Cart, Glaro created a highly functional, versatile cart ideal for use in hospitality, educational, commercial, government, and residential settings! When an economical cart is needed to transport a large capacity of diverse items such as shopping bags, clothes, luggage, golf clubs, sports equipment, audio-visual equipment, conference supplies, and housekeeping supplies, a Glaro Glider Value Condo Cart is an excellent solution. Offered in 40” and 48” lengths with a choice of carpet colors and optional vinyl coverings for the main deck and shelf, the removable shelf has four detachable telescoping containment rails that secure contents during transport. Another set of removable side containment rails is provided for the main deck. Uniquely, Condo Carts are designed to convert to standard luggage carts in minutes without tools. A durable solid aluminum disc hook at each end of the top rail is provided to accommodate hanging items. 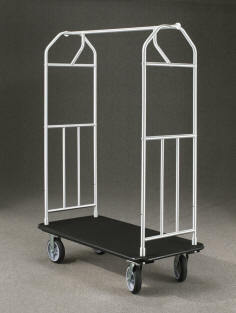 Glaro Glider” Six Wheel Bellman Carts and Hotel Luggage Carts are manufactured by hand and then rigorously tested. The intensive evaluation process ensures that each bellman cart meets the Glaro Inc. quality standards. 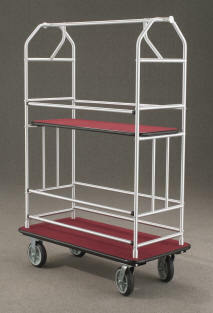 Glaro Value carts have several carpet and vinyl color choices for the deck covering. The tubular structural sections are available in two metal finishes (satin aluminum and tarnish proof satin brass) and 29 designer powder coat colors. Carpet and finish samples maybe requested. Custom carpet logos are offered for larger orders. Black or grey may be selected for casters and bumper colors. If you have any questions about our Value line of economy luggage carts, call (888) 234-1050 to speak to a member of the Glaro Sales team.